It is possible to create links between nodes in the Node view by clicking on one node and Ctrl-clicking (Windows) or ⌘-clicking (Mac OS X) on a second port. Click a node and then Ctrl-click (Windows) or ⌘-click (Mac OS X) the input port of a different node. The nodes are linked. Click the output port of a node, and then Ctrl-click (Windows) or ⌘-click (Mac OS X) a different node. The nodes are linked. 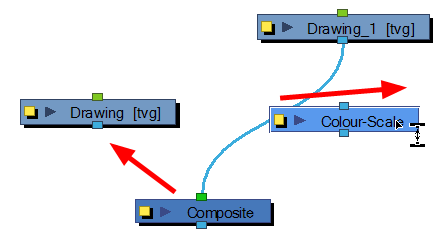 Click the output port of a node, and then Ctrl-click (Windows) or ⌘-click (Mac OS X) a Composite node. 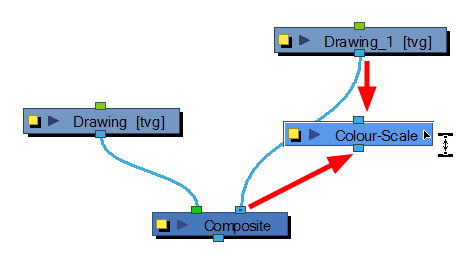 The node is linked to a new input port of the Composite. Click a port of a node and then Ctrl+ Alt-click (Windows) or ⌘+ Alt-click (Mac OS X) port of a Composite node. The selected port replaces the link in the Composite's input port. Click an output port of a node and then Ctrl-click (Windows) or ⌘-click (Mac OS X) the input port of a Group node. The selected output port replaces the link to the group. Click an output port of a node and then Ctrl+ Alt-click (Windows) or ⌘+ Alt-click (Mac OS X) the input port of a Group node. The selected output port links to a new in-port of the group. NOTE: You can reconnect a node's output port without disconnecting its destination port by dragging the connect from the output port to another output port while holding Ctrl (Windows/Linux) or ⌘ (Mac OS X).